LEFT! vs. RIGHT! CONSERVATIVE! vs. LIBERAL! RED! vs. BLUE! 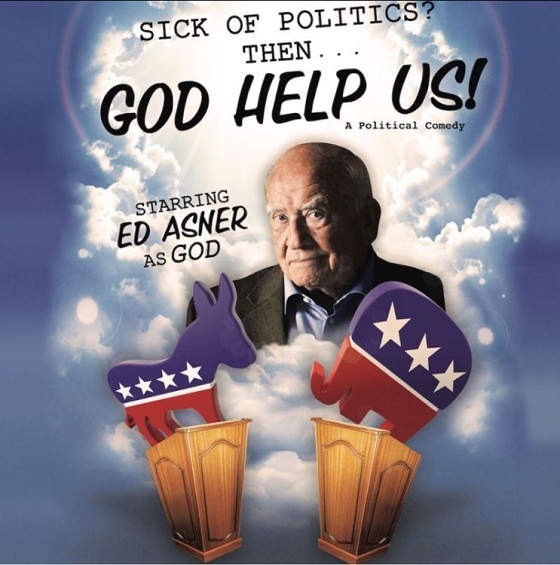 Versatile, committed, eloquent and talented are all adjectives that describe actor/activist and 8-Time Emmy Award-winning actor ED ASNER. He starred as Carl Fredricksen in Pixar’s 2009 box-office- hit Oscar winning Best Picture UP! and as Santa in the Will Ferrell hit, ELF. Mr. Asner was the recipient of his eighth Emmy Award at The CSA Awards for his guest appearance in the Canadian dramatic series Forgive Me. Mr. Asner is best known for his comedic and dramatic talent as the gruff but soft-hearted journalist Lou Grant, the role he originated on the landmark TV newsroom comedy, The Mary Tyler Moore Show, and continued in the newspaper-biz drama Lou Grant, which earned him five Emmys and three Golden Globe Awards. Mr. Asner received two more Emmy and Golden Globe Awards for the mini-series Rich Man, Poor Man and Roots. Jerry is a published playwright, director and producer. Co founder of Image Theater in Lowell, MA, he has appeared in several theater companies in New England over the past 25 years. Jerry is happy to be back on the Regent Stage, where he has had the pleasure of appearing as Don Quixote in “Man of LaMancha”, Groucho Marx in “Hollywood…Ukraine”, and the Pirate King in “Pirates of Penzance”. His favorite roles include Jack Kerouac in “Kerouac’s Last Call” (IRNE Nomination Best Actor), and Billy Flynn in “Chicago.” He has appeared in plays at Speakeasy Stage Company, Image Theater, The Lyric West, Foothills Theatre, Coyote Theatre, The Publick Theatre, Centa Stage, and Hovey Players, to name just a few. He has appeared in a number of local Television commercials and industrial films. It is an honor to appear with a true American icon, Mr. Ed Asner. Barbara Guertin began her career acting in NYC when she was 12 years old. She received her degree in Theater Arts from Rutgers (William Esper, Chair), and has trained in London (with James Roose-Evans 84 Charing Cross Road) and on the West Coast (Commedia Dell’Arte Players of Blue Lake, CA). In NYC, Barbara was a founding member of the Mint Theater Company where she received rave reviews for Mrs. Erlynne in Lady Windermere’s Fan, Society Lady in The Time of Your Life, Marlene Dietrich in The Harvest. Other Off-Broadway productions include Olga in The Three Sisters, Severity’s Mistress at Soho Rep and countless new plays at EST, Primary Stages, Naked Angels and Playwright’s Horizons. Barbara has appeared in scores of films, commercials and theater productions nationwide. She is currently Managing Director of 4th Wall Stage Company in Worcester, where she produces and directs classic and edgy American plays. She is also a proud member of SAG-AFTRA and Actors’ Equity Association and so honored to be working with the iconic Mr. Asner.